Mentrum Petroleum Jelly - This is great because, simply put, it's like a tube of Vaseline, which is a lot easier to apply than from a tin or tub. I'll be using this on anywhere that's dry, and my hands throughout the winter. I don't know if it's just because it's in a tube, but this seems to have a smoother texture to other petroleum jellies I've used in the past. Brigitte Smoothie Lip Tint - Apparently 'Fig Coral' is going to be the biggest shade in Japan this year, and that's the shade of this lip tint. It's quite a pretty pink, which isn't a colour I'd usually go for, so I may give it away as a gift. It does, however, have a nice texture and the applicator actually works well! So many glosses have terrible, foamy applicators that just absorb product. Brigitte Lasting Liquid Eyeliner - I like this a lot. It's a light brown, almost auburn, colour which is a huge change from the black eyeliners I usually go for. Having it in the form of a pen makes it easy to apply and I noticed it dries pretty quickly, so there's not a lot of time for making small changes or adding more layers if you need to. This is definitely one I'm going to be trialing a bit more. Love Switch Oil Treatment Mascara - Do eyelashes need an oil treatment? Probably not, but sometimes a bit of a pointless pamper is fun. This is basically a black mascara with oils in (including avocado and hazelnut) to treat your lashes. I was initially put off by the very strong lavender scent as that didn't seem like something that was smart to put near your eyes, but a few hours later there's no signs of irritation so I think we're okay. The applicator, again, is surprisingly good and the mascara itself isn't too heavy or clumpy, which is a huge plus for me. Lucky Wink Super Cover Foundation Brush - This is the 'trendy' brush type at the moment from what I've seen across the internet, but I don't actually own any foundation at the moment to try it out. What I can say is that the bristles are so super soft. 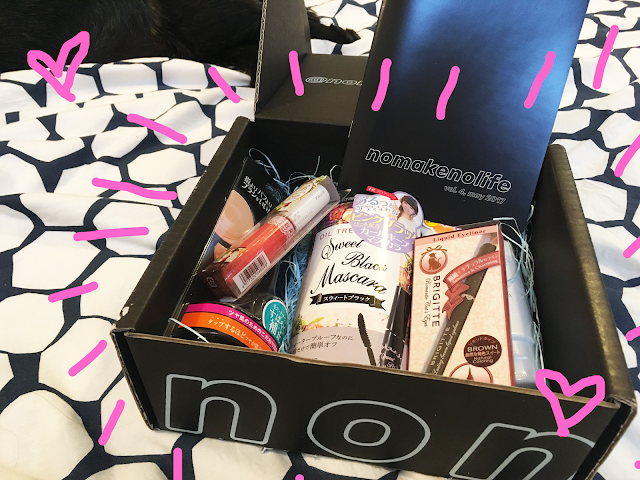 The No Make No Life box sells at $29.99, with free international shipping, and contains between five and seven products each month. The theme of the products changes each month, so this one was quite make-up heavy when I was really interested in trying some Japanese skincare, but I'm still happy with the quality of the products. You can try one of the boxes yourself by following this link (which if you do buy via, I'll receive a small commission).